Life is like a matchbox. Matchsticks are inside the box. If you want to illuminate your life, then you've to ignite yourself. In every juncture of life, there are many ups and downs. And every moment you need motivation and encouragement. It may be from yourself and from your dear ones. However, the question arises, how? If nobody is around you. Then, it’s only you to motivate and encourage yourself. Because, life is a lone journey. First think and then act. Always remember, that you’re the only one who can change yourself and nobody can change you. 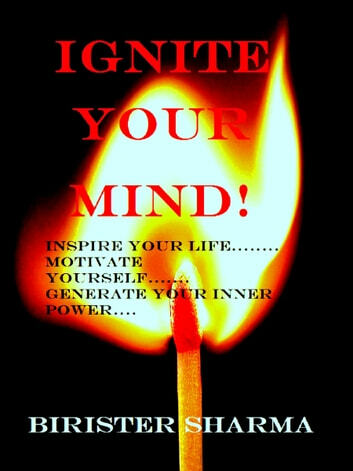 If you want to light the darkness of your life, then, ignite Your Mind! * This book is written in very simple poetic rhymes. * This book is to ignite your hidden potentials. * This book is to know your true-self. * This book will act as your true guide. * This book contains with moral, wisdom, thoughts and philosophies. * This book will teach you to learn everyday lessons of life. * This book will always guide you to your success path. * This book will help you to mould your habits and characters. * This book is for those who want to motivate and inspire themselves. What you want to do be? Everything depends upon your vision. You must know the right command. To succeed in your mission. Don’t spend your life like a timid. To get your golden luck. So that you can shine like a diamond. Only you can change yourself! You are born to be Wise! You will never regain it! Livres similaires à Ignite Your Mind! ((Inspire your life....Motivate yourself....Generate your inner power...) Leads you to find your lost self-esteem,self-confidence,self-discipline, self-control,energy,faith,happiness & success.